The soybean or soya bean (Glycine max) is a species of legume native to East Asia, widely grown for its edible bean that has numerous uses. The plant is classed as an oilseed rather than a pulse according to the UN Food and Agricultural Organization (FAO). The soybean or soya bean (Glycine max) is a species of legume native to East Asia, widely grown for its edible bean that has numerous uses. The plant is classed as an oilseed rather than a pulse according to the UN Food and Agricultural Organization. Soybeans have increased in popularity with new soy products like soy milk and textured vegetable protein or tofu. Luckily, this traditional food possesses many health benefits. Here are the 7 health benefits of soybeans. 1. Soybeans can help individuals control weight. Soybeans have been known to suppress the appetite, helping people eliminate the chances of overeating that leads to obesity and other health related risks. Also, soybeans provide considerable amounts of protein, which can lead to weight gain when taken in large quantities. The weight obtained from soybeans could protect the individual from chronic diseases, such as type 2 diabetes and cardiovascular diseases. 2. Soybeans can contribute to improving your sleep. Soybeans have a high content of magnesium, which is a mineral that is directly linked to improving the quality, duration, and tranquillity of sleep. Soybeans also help regulate the metabolism, to help reduce sleep disorders and the occurrence of insomnia. 3. Soybeans may help prevent and manage type 2 diabetes. Soybeans have the ability to increase insulin receptors in the body. This helps the body to handle the disease effectively or prevents diabetes from forming at all. 4. Soybeans can contribute to improving circulation and oxygenation. Soybeans are rich in copper and iron. Both are essential for the red blood cell formation. Increased red blood cell production increases oxygen to the cells and improves the metabolic activity. This prevents conditions like anemia. 5. Soybeans may help to improve your digestive health. Fiber can help prevent constipation and stimulate the contractions of the smooth muscles that forces food through your system. This aids in preventing dangerous conditions like colorectal cancer. 6. Soybeans can help decrease the risk of congenital disabilities. Soybeans are rich in the B-vitamin complex, particularly in folic acid. Folic acid helps the body to make healthy red blood cells and prevents anemia. It is also important for maintaining rapid cell division and growth during infancy and pregnancy. A deficiency of folic acid in pregnant women can lead to the birth of underweight infants and may also result in neural tube defects in newborns. 7. Soybeans have a significant vitamin and mineral density. Soybeans are an excellent source of calcium, magnesium, copper, selenium, and zinc. These have a role in preventing osteoporosis and help speed the bone healing process. Leggett, J. E., & Gilbert, W. A. (1969). Magnesium uptake by soybeans. Plant physiology, 44(8), 1182-1186. Berk, Z. (1992). Technology of production of edible flours and protein products from soybeans. Kwon, S. H., Ahn, I. S., Kim, S. O., Kong, C. S., Chung, H. Y., Do, M. S., & Park, K. Y. (2007). Anti-obesity and hypolipidemic effects of black soybean anthocyanins. Journal of medicinal food, 10(3), 552-556. Lo, G. S. (1989). Nutritional and physical properties of dietary fiber from soybeans. Cereal foods world (USA). Ikeda, Y., Iki, M., Morita, A., Kajita, E., Kagamimori, S., Kagawa, Y., & Yoneshima, H. (2006). 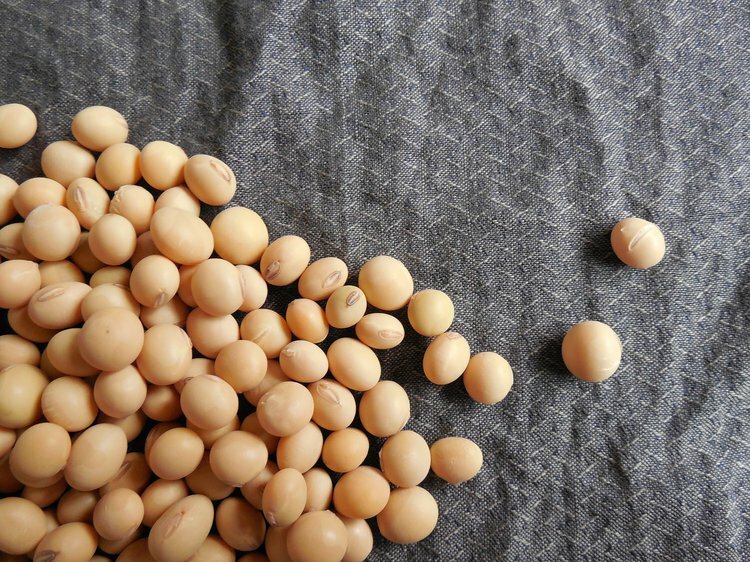 Intake of fermented soybeans, natto, is associated with reduced bone loss in postmenopausal women: Japanese Population-Based Osteoporosis (JPOS) Study. The journal of nutrition, 136(5), 1323-1328. Rasmussen, A. I. (1978). Nutrient comparison of fresh and field-dried, green-seeded soybeans. Journal of the American Dietetic Association, 72(6), 604-608. Kang, M. J., Kim, J. I., Yoon, S. Y., Kim, J. C., & Cha, I. J. (2006). Pinitol from soybeans reduces postprandial blood glucose in patients with type 2 diabetes mellitus. Journal of medicinal food, 9(2), 182-186.